Enough bars for the whole pack! Designed for child athletes but strong enough for their parents, the Kids' Pull-up Bar adds a safe, versatile new element to an existing Rogue Infinity rig or 2x3” rack. This 39", 1.25" diameter pull-up bar uses a convenient push-pin system to adjust from ground level up to a height of seven feet. This makes it ideal for the progression of a growing child, or for home gyms and weight rooms utilized by young people of various ages and sizes. Tested at over 500LB, the Kids' Pullup Bar is a far safer option for child pull-ups than lifting the kid up to a standard bar or having them stand on a box. A friendly price tag makes it all the more worthwhile for anyone supervising or working with children interested in strength training. 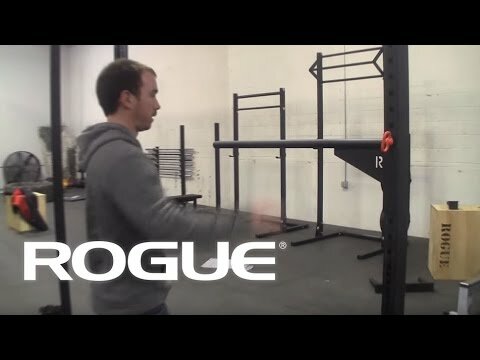 Rogue Infinity Kid's Pull-up Bar is rated 4.5 out of 5 by 11. Rated 3 out of 5 by randall from Dissapointed Overall, it's solid and will handle more load than my kids can put on it. The big let down is how much movement there is on the bar. Kids like to be crazy, not only doing pull ups but swinging and having a great time. This bar moves a lot side-to-side and doesn't lock in to the upright. I wouldn't recommend for that reason. Rated 3 out of 5 by Joseph Warren from Not Rogues Best It is built like a tank but it doesn't sit level. It's off by about 1 inch, so there is a visible decline. For me that is one too many, but I have no doubt it can hold a kid.